My reading today included a couple of examples of how often people opine about education reform and seem not to understand schools or classrooms. In Open Forum, Tuesday, Feb. 5 (“How to improve education, housing”), Lee E. Ohanian and John B. Taylor offer recycled education reform ideas that won’t work. They assert vaguely that “studies show” support for their arguments, though “studies show” the opposite as well. The authors seem to want a retrial of the recently litigated Vergara case, even though two appellate courts, including the California Supreme Court, ruled that the superstar education reform lawyers couldn’t prove their arguments regarding any need to change laws regarding tenure and seniority. Strengthening California schools is neither simple nor cheap, though the authors argue the former to pursue the latter. They focus on “bad teachers,” hoping weaken unions and justify lower compensation. California needs robust investment in comprehensive system-wide improvements, and we need teachers–not Hoover Institution economists–leading the way. What lecture? 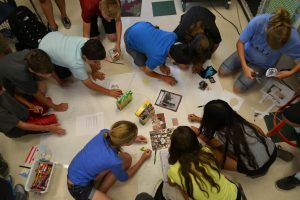 Middle schoolers collaborating in Rebecca Mieliwocki’s classroom in Burbank, CA. My readers who are also currently teachers will immediately recognize the faulty assumptions here. We’ve been working–for decades now–away from any “lecture-based model.” Though teachers do still employ lectures at times, and some more than might be wise, I don’t know any individual or school that would own up to a “lecture-based model of education.” Lecture became a bad word in K-12 education many years ago, though I still think the right lecture at the right time in the right proportions still has a place in a teacher’s toolkit. We may not all be “learner-centric” but it’s not like AltSchool was had some groundbreaking revelation here, and it’s hard to understand how any savvy investor doing their homework could be wowed by a pitch based on this shift; it’s already well underway and entirely mainstream. Some teachers and schools do it more than others, and not all that are doing it more are doing it well. The article in Forbes offers up some less-than-inspiring glimpses into AltSchool practices. (Though before delving into these, I must acknowledge that a reporter’s selection of details and quotes is inherently limited). In a 7th and 8th grade Humanities class, students have read essays by James Baldwin and Ta-Nehisi Coates. None of the comments or reactions in the article seem grounded in the students’ readings, and the “learner-centric” approach described seems unconcerned with continuity, deeper analysis, or shared understanding. In a kindergarten class, a student finishes a worksheet, takes a photo of it on an iPad, and shares the digital file with the teacher, who can also now email the worksheet to parents. So, first of all “worksheet” is another taboo word in education these days, hardly “alternative.” And then, the student is being trained to make digital copies for the convenience of the adults; the teacher is presumably in the same room and could… wait for it… review the actual worksheet! And wow, I sure remember getting folders and folders full of my kids’ worksheets, without having to open an email. I actually think if I received emails of my kids’ work I would have reviewed less of it over the years. (And in case any clever reader is wondering, yes, my high school students do have digital folder and portfolios of their work, which is appropriate for work that was produced digitally and which requires some digital functionality). So, yeah… I guess angel investors were tripping all over themselves for… this? These two articles together illustrate something worth noting, how non-educators with expertise in fields like economics, technology, and investment, often think they’re the smartest folks in the room, and certainly smarter than mere teachers. As long as they’re arrogant enough to think so, I’ll consider it both a duty and a kindness to point out their ignorance and give them a chance to learn. Well done. ‘Less than inspiring,’ indeed. While you’re absolutely correct that public school teachers have been battling these misconceptions about THEIR core work for decades, please don’t stop.